But things aren't as simple -- or tranquil -- as they appear. The "pirates" they encounter aren't what they seem, and the "peaceful integration" they expected turns into something very different. A powerful alliance of corrupt Solarian League bureaucrats and ruthless interstellar corporations is determined to prevent the Cluster's annexation by the Star Kingdom . . . by any means necessary. 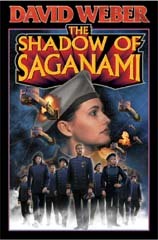 Pirates, terrorists, genetic slavers, smuggled weapons, long-standing personal hatreds, and a vicious alliance of corporate greed, bureaucratic arrogance, and a corrupt local star nation with a powerful fleet, are all coming together, and only Hexapuma, her war-weary captain, and Honor Harrington's students stand in the path. They have only one thing to support and guide them: the tradition of Saganami. The tradition that sometimes a Queen's officer's duty is to face impossible odds . . . and die fighting.